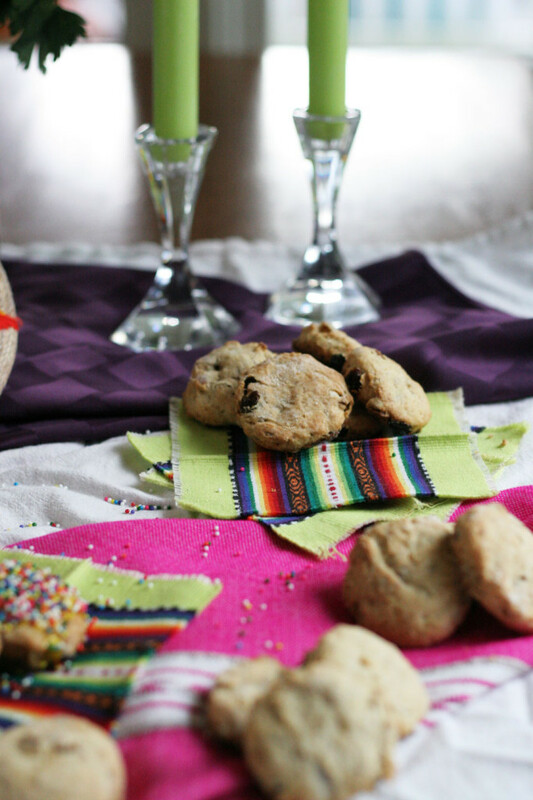 My producer over at AM Northwest’s had an idea to share a cool recipe to celebrate Dia de los Muertos and the upcoming release of a movie I am super excited to see, The Book of Life. I love animated movies and dessert, so this worked out! Here is the segment on ABC’S KATU AM Northwest! I was brainstorming ideas to share on the segment, when this tasty cookie popped in my head, so I told her about it. She and her boss loved the cookie idea. I sat down to write this post this past weekend and I had already worked on the recipe, so it was ready to go. I was telling my Mom what recipe I chose for the segment, and she kindly told me they are not from Mexico :). 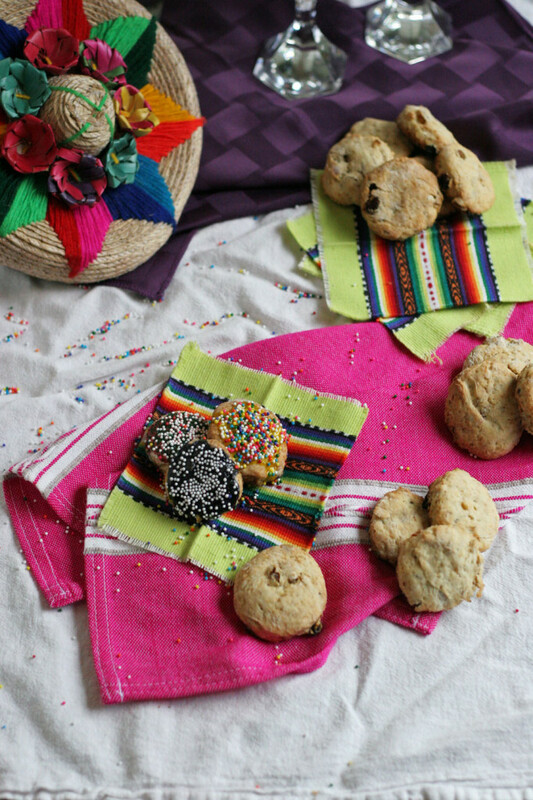 I did a Google search to get some background on the Pabassinas, it came up as a Sardinian cookie, not Mexican!!!! I was dying laughing, no pun intended. Here I am Mexican, making cookies for Dia de los Muertos that I have eaten from other Mexicans at Dia de los Muertos alter celebrations, but they are far from a traditionally Mexican cookies. They seem Mexican, we like nuts and raisins in cookies, so it kind of worked out. They celebrate Day of the Dead in Sardinia, so it must have gotten to Mexico and they adopted it. Culinary travels…very common. My produce loved it when I told her my issue of mistaken cookie identity. So we are moving forward with sharing this Sardinian cookie in the hopes to Culinary educate on where these cookies came from, and it’s a good funny story. 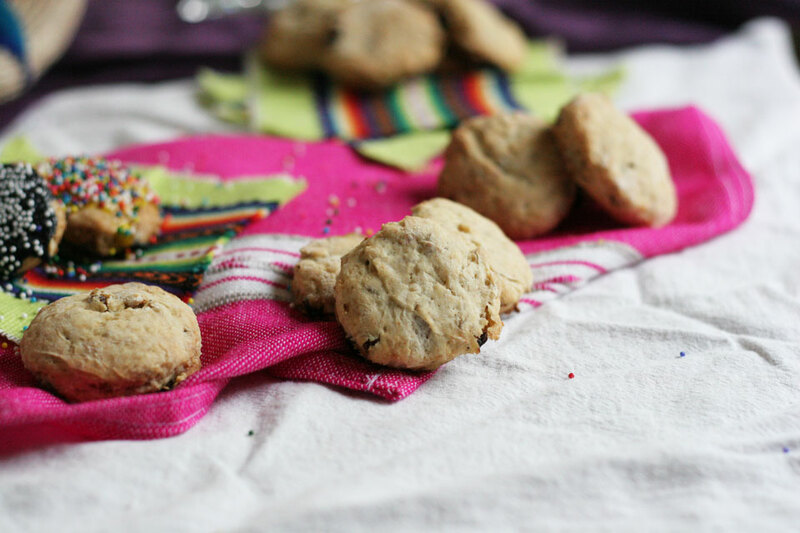 Sardinian turned Mexican almond raisin cookies! These sweet treats are called Pabassinas, and are filled with almonds, walnuts, raisins. I used golden ones for a sweeter better raisin flavor in my opinion. You could also stray away from tradition and use currants or dried cranberries if you are a raisin hater. And if you are, have you tried the golden one instead? I pretty much only use the golden ones, I prefer the flavor. You could also go crazy fun times, and decorate the cookies. Although I went to Culinary School as a pastry chef/baker graduate, I do not enjoy the decorating aspect. I love baking, making, and cooking. I love a pretty decorated cookie. However, I will not be doing the decorating. You can also make these any shape your heart desires. There is no typical shape that is traditional for this cookie that is usually presented on the the alter for Dia de los Muertos. I rolled out the dough and used a round cutter, I like circle simplicity. 1. Combine flour, sugar, yeast, baking powder, salt, orange powder, and cinnamon in a large bowl. Whisk to combine. Add butter, using finger rub butter into flour forming pea sized chunks. 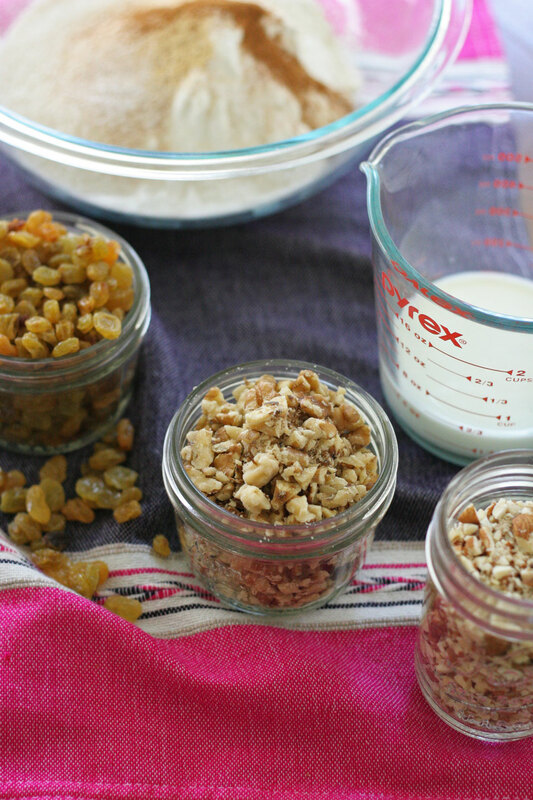 Add raisins, almonds, and walnuts, use spatula to combine. Add 1/2 cup milk, water, and vanilla, use spatula to combine. Note: you can also use a stand mixer with paddle attachment to make this entire recipe. 2. Turn dough onto lightly floured counter. Using a rolling pin, roll dough out to 1/4-1/2 inch thick. 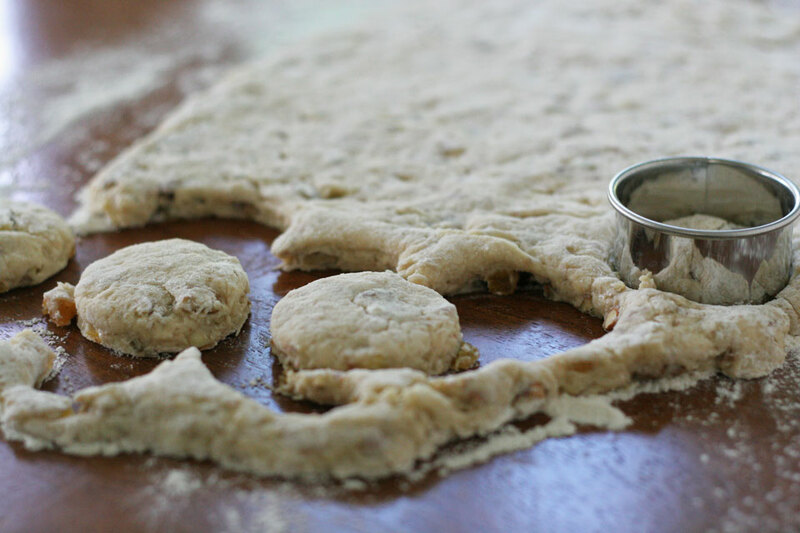 Use a cutter in any shape you like, cut out dough. Place on parchment lined baking sheets. Bake for 20-25 minutes, or until light golden brown. Because there is yeast in the dough, and depending on the size cookie cutter you use it can sometimes take up to 30 minutes. Just check until golden brown. Remove from oven and place on cooling rack until completely cooled before decorating. 1. While cookies are baking, make icing to decorate (optional). Place confectioners sugar, egg whites, lemon juice, and vanilla extract in stand mixer with paddle attachment, or large bowl with hand mixer. Mix until combined well. Adding colors to icing: Add a tiny drop at a time to play with different colors. If you add too much, the icing will become too runny. You can split the batch of icing to make separate color, or simply double the recipe to have tons to play with. These are really good! They are not too sweet and are kind of like a dense cookie-buscuit-scone. I love all the nuts and raisins inside. The beautiful pictures were helpful. I made them for my son’s Day of The Dead celebration in his Spanish class. It made about 24 with a 2 3/4 inch round cutter. This is the best comment ever! I am so happy you like them and took them to a Day of the Dead celebration, that is so great. Thanks for trying my recipe and letting me know you liked it. I love that!